A Coast Guard boat escorted the Lady Washington during a 2007 visit to the mouth of the Columbia. 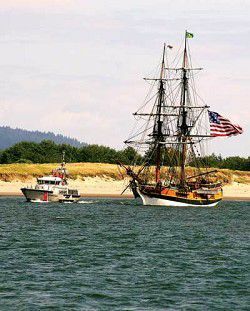 The tall ships Lady Washington and Hawaiian Chieftain will soon visit Ilwaco. 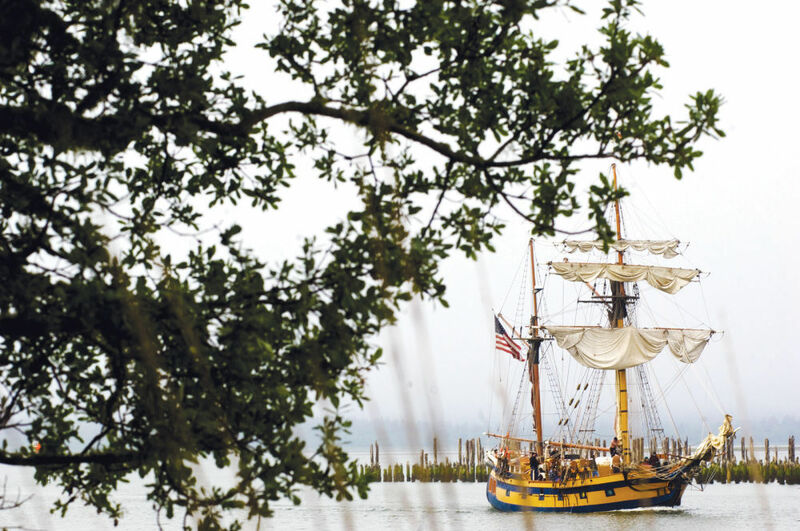 ILWACO — The Pacific Northwest tall ships Lady Washington and Hawaiian Chieftain will be making a return visit to Ilwaco from May 7 through 15. While in town, the vessels will be docked at Port of Ilwaco, 165 Howerton Ave., and will offer educational programs, vessel tours, and sailing trips for the general public and by private charter. The steel-hulled Hawaiian Chieftain was built in 1988 in Lahaina, Hawaii for Laurence “Baron” Dorcy Jr. Its design reflects the packet trader ships that sailed coastal New England in the mid 1800s. Hawaiian Chieftain was acquired by historical seaport from private ownership in 2005. Hawaiian Chieftain is also the host of the historical seaport’s professional maritime training program, the Seafarer Collective. The wooden-hulled Lady Washington was built in 1989 in historical seaport’s home port of Aberdeen to commemorate the centennial of Washington’s statehood. She is a replica of the 18th century vessel of the same name which was the first American ship to make landfall on the West Coast. Movie fans might recognize Lady Washington from her roles in “Pirates of the Caribbean,” “Star Trek: Generations,” ABC’s “Once Upon a Time,” and many other features. Wednesday through Friday, schools can reserve a trip aboard the tall ship for historical seaport’s original maritime heritage field trip Voyage of Explorers. On weekends the tall ships are open to the general public for ticketed Adventure Sails, Evening Sails, Battle Sails, and occasional special events. Vessel tours, which take place aboard the tall ships as they are docked in port, are Friday through Sunday by a $5 suggested donation. Hawaiian Chieftain can also be chartered for private events including weddings, parties and films. For tickets and more information about Grays Harbor Historical Seaport and its tall ships — including crewing and Membership opportunities — guests should visit their website at historicalseaport.org or call 800-200-5239.